A couple of months ago the local council put out an invitation for quotes for a 130 sqm mural for the side of a new art centre they were creating from an old fire station. My gorgeous friend Jacq (amazing artist from funkydory) suggested that her, myself and my husband James (who owns creativeworks - a very successful airbrush studio here in Perth...I don't think I've introduced him before?) team up and submit a proposal. And guess what...we were accepted!! So, I have been very busy working on the mural and (unfortunately) not so busy replying to your emails and updating facebook...sorry!! Anyway...I thought you might like to see a little behind the scenes? The brief was quite open-ended and a little tricky...the council were after something that would stand out, that gave a sense of liveliness and that was preferably non-representational...something bright, but natural...and also something that would carry the design and colours from the front of the building down the side. 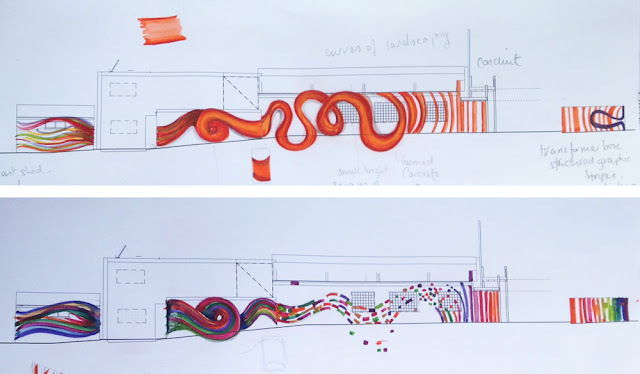 ...so the design also needed to work in with the colours of this...but while the font of the building and landscaping is quite geometric...the landscaping down the side of the building (where the mural would be) is quite organic and flowing...so that was another consideration! And so...on the 1st September we got started! I'll keep you up to date ion the progress, but in the meantime, let me apologise in advance for being a little tardy in getting back to you! This is awesome tania. great stuff. No wonder you have been busy. This looks awesome Tanya - what a fabulous experience. I love those colours in that last photograph, incredibly vibrant. Congratulations! love it! can't wait to see the end result! P.S. ~HEY!?! 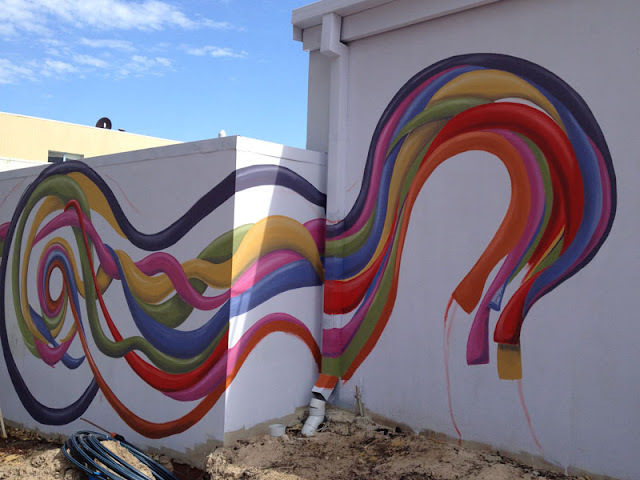 I WANNA PAINT A BUILDING ALL FUNKY TOO?!! !